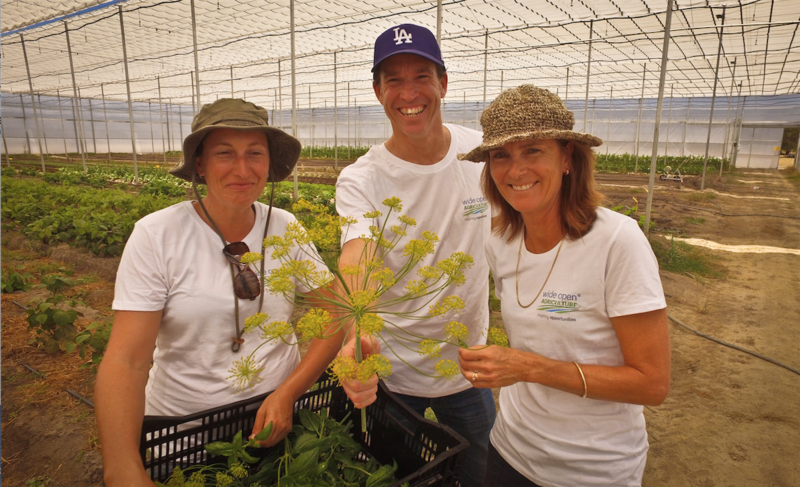 Image: Head Grower Kerry Dell’Agostino, CEO Dr Ben Cole and Sales Manager Merilyn Elson in The Wedge smart shade house at Arthurton in Western Australia. Supplied. A WA-BASED PRIVATE equity business has recently launched an Initial Public Offering (IPO) with the aim of becoming the world’s first ‘4 Returns’ company to list on a stock exchange. Wide Open Agriculture is the parent company to three main enterprises – high-tech glasshouse production, a paddock-to-plate food brand and collaborative farming venture with existing landholders. All three enterprises are located in the West Australian Wheatbelt, a region traditionally renown as a broad acre cropping and sheep grazing district. But according to company director Dr Ben Cole, the region provides near perfect growing conditions for horticulture systems. ‘The local climate is really suited to growing crops in glass houses, as long as you can manage frost and extreme UV, and the retractable roof on our glass houses allow us to control for these conditions’. The company was formed when the founding directors saw an opportunity to capitalise on the premium status the region had earned from employing sustainable agriculture practices such as reduced chemical use. As a resident of the Wheatbelt town of Williams, Dr Cole was also concerned about the trend of people moving from rural areas to big cities. ‘In the last 20 years, we’ve seen massive depopulation, which is a concern for someone like me raising a small family in the bush. We want to see more farmers and more people living in rural areas, which stems from creating more jobs – in farming as well as value adding’. Wide Open Agriculture works on a ‘4 Returns’ model – placing emphasis on measuring financial, social, environmental and inspirational returns. ‘Likewise, if the soil on your land isn’t functioning and you have poor water quality, you’re not harnessing the free stuff you need to do business in agriculture’. ‘The financial return is of first and foremost importance, but valuing the other three returns adds more value for investors than you’d expect’. The 4 Returns framework was developed by Netherlands-based Commonland Foundation – an NGO that invests in projects to restore degraded landscapes to improve the sustainability of the associated communities. Commonland is also the largest shareholder in Wide Open Agriculture with 12,000,000 shares, which will represent a 17% stake in the company upon completion of the current IPO. Wheatbelt farmer Stuart McAlpine has recently entered into a collaborative farming venture with Wide Open Agriculture, having sold the company 320 hectares of his cropping and livestock farm. Mr McAlpine has a long-term lease option on the block, with a holistic farm plan drawn up between the two parties. The plan applies a three-zone approach to the farm with 150 hectares – the ‘economic zone’ to be managed by Mr McAlpine in sync with the rest of his grain and livestock enterprise, with all profits to be retained by him. Approximately 30% of the land (98 hectares) was planted to perennial grazing shrubs in August 2017, with the aim of demonstrating the benefits of fodder forage shrubs as a sustainable source of livestock feed. The long-term intention for this ‘combined’ zone is to return a profit to both the farmer and investor, while successfully improving ecological returns through regenerative farming methods. A third zone – ‘nature’ – will be the site of a revegetation program to provide valuable habitat for native flora and fauna species. ‘As a farmer, the opportunity to move to a regenerative farming model is exciting, but we needed to unlock some capital to provide sufficient investment into it’, said Mr McAlpine. ‘This approach allows us to keep managing the land, with the resources we need to make significant changes and demonstrate the benefits of a better way of farming’.